Well, it may sounds odd to some but have you thought of getting Christmas present for your pet fish? 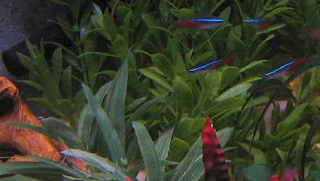 I stumbled upon this idea few years back when my stock of neon tetra fish was still around. As usual, shopping for our Christmas gift to exchange with friends and relatives has been a normal routine in preparation for the big day. The list was long but nevertheless, we did our best going through the list careful so that we don’t miss out anything. That’s when something crossed my mind on why my pet fish has been left out all these years. So without much ado, I hurriedly rushed over to my favorite fish store and scout around for the perfect gift. Several items mainly related to aquarium supplies were short-listed like new aquarium filter, nutritious fish food or maybe a new fluorescent light for the aquarium, which I think serve more purpose more than anything else. In the end, we settled for a decorative cave. I can’t explain why, but I think if I were to get something for them, I would go for an item, which they would like to have, and could accompany them around. I knew I bought the perfect gift because when I put in the decorative cave into the aquarium, I could see that they enjoyed swimming around and hiding in their new found home.